Chinese President Xi Jinping heads to Africa this week as Beijing moves to further cement its role as one of the continent's closest economic and diplomatic allies. After a brief stop in the Persian Gulf Thursday, Xi's itinerary -- his first overseas trip since beginning his second term as leader -- takes him to Senegal, Rwanda, South Africa and Mauritius, spanning almost every corner of Sub-Saharan Africa, where China's economic clout, and strategic ambitions, are growing by the year. [post_ads]China is Africa's largest trading partner, overtaking the United States nearly a decade ago. Bilateral trade reached a record-high of $220 billion in 2014, official statistics show. Chinese leaders have always made a point of visiting African nations regularly and early during their time in power. 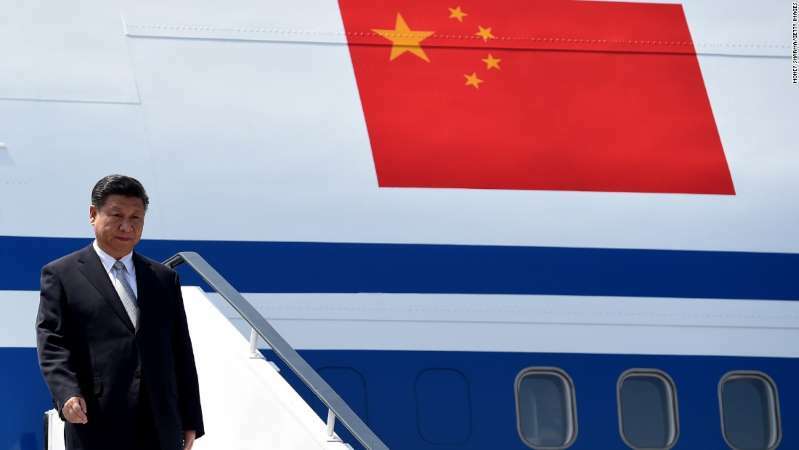 When he assumed the presidency in 2013, Xi also chose Africa as part of his maiden journey abroad and went on to visit the continent two more times during his first term. China's interest in Africa isn't just about trade, the continent also provides a large amount of raw materials which China couldn't get otherwise, while also acting as a pro-China political bloc at the United Nations. Ian Taylor, an Africa expert at the University of St. Andrews, said the US is increasingly losing its influence on the continent because it "took Africa for granted." "The Americans seem to look at Africa through this security lens ... which is completely different from the Chinese perspective," h e said. "They look at it from an economic perspective -- the Americans are lagging big time." Xi's exact itinerary has yet to be released, but he will return to South Africa on July 25 to take part in the BRICS summit, alongside Russian leader Vladimir Putin. At first look, Rwanda and Senegal appear unusual choices given they don't receive a large amount of investment from China nor are they large countries in terms of population. But Taylor, the St. Andrews professor, points to Rwanda's key position in the Belt and Road plan, Xi's ambitious global trade and investment scheme which aims to enhance economic connectivity between Asia, Europe and East Africa. "Rwanda is hoping to integrate itself into the burgeoning railway networks in East Africa, as part of the Belt and Road initiative," he said. "Kigali is moving towards diversifying its relationship away from the US, away from the European Union, and China sees a good opportunity to develop ties." For Senegal, there have been suggestions the Chinese government might be interested in the possibility of building ports on the Atlantic Ocean. Gordon G. Chang, an American political commentator best known for his book "The Coming Collapse of China," said the selection of Senegal and Mauritius, respectively, is consistent with China's attempts to establish a presence on Africa's Atlantic coast and to dominate the Indian Ocean. "It's amazing how well the Chinese do (in Africa) -- because they are unopposed," he said. Taylor said the diverse itinerary shows the Chinese leadership is "spreading the (diplomatic) love" across African nations, to boost Beijing's influence in the region. "This is massively appreciated in most African countries, especially by the political elites, the way in which China quite uniquely in some respects treats all countries at an equal level ... at least rhetorically and in the diplomatic process," he said. Chinese analysts view the ever-closer bilateral ties with African nations as a natural result of the Beijing leadership's decades-long cultivation of relations with the continent, dating back to the early days of the Communist government in the 1950s. "The importance of Africa in China's diplomacy has been consistent," said He Haiping, an Africa expert at the Chinese Academy of Social Sciences (CASS), a state-run think tank. "The Belt and Road initiative has only accentuated the role of Africa even more." Already, Chinese-built infrastructure -- railways, roads, dams, telecommunication networks and power stations -- is rapidly changing the physical appearance of Africa. Chinese-owned mines and factories churning out everything ranging from minerals to shoes -- combined with an influx of big-spending Chinese tourists -- are redefining the continent's economic landscape, while Chinese-funded educational programs and media outlets have grown in size and increased their influence over young Africans. China is also bolstering its diplomatic and military presence on the continent, becoming more active in UN peacekeeping missions and even opening its first overseas naval base in Djibouti last year -- with the latter move triggering alarm in Washington and other Western capitals. Problems and controversies have emerged along with China's expanding footprint in Africa, with critics labeling the country a "neo-colonialist" only interested in exploiting the continent's rich resources and cheap labor. Activists have highlighted cases of human rights abuse that include ill treatment and poor pay of local workers. He, the CASS expert, acknowledges "growing pains" in bilateral ties but said there were tangible economic rewards for both sides. "If African nations feel colonized, why would they keep cooperating with China?" she said. "It would be an insult to the African people's wisdom -- they clearly know how to maximize their benefits in cooperating with China." One thing analysts did agree on, however, is Beijing's commitment to Africa -- which even critic Chang described as "deep and widespread" -- as reflected by Chinese leaders' frequent visits, in contrast to Washington's relative lack of attention to much of the continent. "The US needs to do so much more -- you don't have American presidents going to Africa that often, which is a shame," Chang added. "Africa is not on the US agenda," He said, before taking a swipe at the US president's reported off-the-cuff remarks early this year when discussing immigration policy with lawmakers. "And when Trump mentions Africa, he calls them 'shithole countries'." Steven Jiang reported from Beijing, China. Ben Westcott reported from Hong Kong.